As the market in the Conejo Valley heats up not only temperature wise but also in real estate we’ll have less time to devote to the market report. So, going forward I’m just going to give you some basic information on the current market and if you have any specific questions please feel free to submit a comment below and we’ll respond asap. 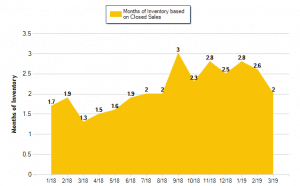 And finally months of inventory is up 51.9% and as per the graph in the image above we are in a Sellers Market.